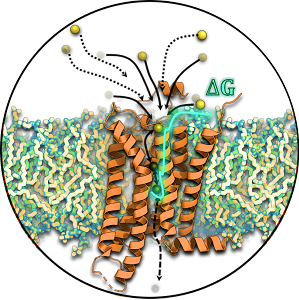 The allosteric modulation of GPCRs by sodium (Na+) ions has drawn significant attention due to the availability of crystal structures of several receptors showing Na+ ions bound to the inactive conformations at the conserved Asp2.50. To date, structures from 24 families of GPCRs have been determined, though mechanistic insights into Na+ binding to the allosteric site are limited. We performed 100’s of μs long simulations of 18 GPCRs and elucidated their Na+ binding mechanism. In class A GPCRs, Na+ ion binds to the conserved residue 2.50 whereas in class B, it binds at 3.43b, 6.53b and 7.49b. Using Markov state models, we obtained the free energy profiles and kinetics of Na+ binding to allosteric site, which shows a conserved mechanism of Na+ binding for GPCRs and reveals the residues that act as major barriers for ion diffusion. Furthermore, we also show that the Na+ ion could bind GPCRs from the intracellular side receptors with allosteric site inaccessible from extracellular side.